by ADN Kronos International. November 18, 2010. The Hague, 18 Nov. (AKI) - A Dutch member of parliament Joel Voordewind, is urging the Netherlands to help Iraq's Assyrian Christians establish their own northern autonomous region and police force, the Assyrian International News Agency reported on Thursday. Voordewind's move comes after a spate of deadly attacks targeting Iraq's Christian minority of approximately 500,000, which has left its members in fear of their lives. Most want to emigrate. 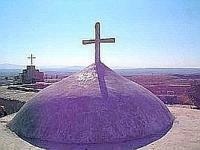 Before the 2003 United States-led invasion and occupation of the country, there were around 800,000 Christians in Iraq. Around 100,000 Iraqi Christians who have been left homeless have taken shelter in northern Iraq in the Plain of Nineveh. Kurds, who were persecuted by late Iraqi strongman Saddam Hussein, were allowed to develop their own militia and police to defend themselves. They also have their own autonomous region in northern Iraq. Voordewind, an MP for the Christian Union party, wants an Assyrian autonomous region to be governed and secured by its police and militia. The region would be established in the Nineveh Plain in North Iraq, where around 100,000 Chistians have taken refuge since 2003. "The three big groups, Kurds, Sunnis and Shias have their own police and militia, only the Assyrians do not have this," said Voordewind, quoted by AINA. Voordewind is calling on the Kurds to help the Assyrians, arguing they should give the kind aid to Christian Assyirans which they have received from the international community. "When I visited the Nineveh Plain in 2008, Assyrians showed me messages given to them from Muslims, saying 'you Christians dogs, leave or die,'" AINA cited Voordewind as saying. "If we don't help them with an autonomous region," he adds, "they will leave the country." Voordewind has asked the minister of defence to help the Assyrians establish an autonomous region. by ADN Kronos International. November 22, 2010. Baghdad, 22 Nov. (AKI) - Terrorist attacks against Christians have caused those living in Mosul to consider leaving the city in Iraq's north, according to Emil Shamoun Noona, the Chaldean Catholic Archbishop of Mosul. "Our community is terrorized and is seriously thinking about leaving Mosul," Noona told Adnkronos International in an interview. "Many Christian families have asked for ecclesiastic documents needed to move abroad and this indicates their intention to emigrate." Fifty-eight people died during people the 31 October attack on a church in Baghdad that was claimed by an Al-Qaeda linked group. Further threats have been made against Christians in the Middle East and northern Africa. There are approximately 500,000 Christians remaining in Iraq but last month's attack on Our Lady of Salvation and a string of subsequent bombings have left the country's Christians in fear for their lives. Noona says he has little faith in Iraq's ability to protect its Christians. "The solution is in the hands of the state that is responsible for the protection of its people but in my opinion it is totally incapable to do this," he said in the interview. Iraq's leaders have spoken out against the violence and pledged to protect the religious minority, but "we continue to be threatened and killed. We've been forced to leave."